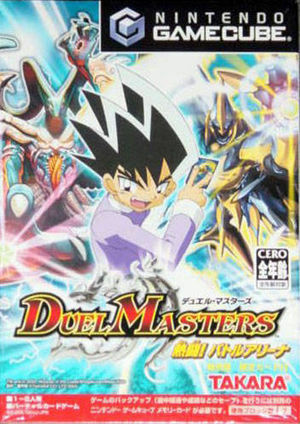 Based on the Duel Masters Trading Card game in Japan, Duel Masters Nettou! Battle Arena puts you in the role of a kohai (junior duelist). Your grandfather, a great Sempai (senior duelist), gives you a valuable Duel Masters card, which is soon stolen by a mysterious man. Now it is up to you to travel to nearby towns and villages in hopes of regaining the stolen property. Along the way, you'll face many opponents in Duel Masters tournaments with the hope of one day becoming a professional Duelist. The graph below charts the compatibility with Duel Masters Nettou! Battle Arena since Dolphin's 2.0 release, listing revisions only where a compatibility change occurred. This page was last edited on 15 October 2018, at 06:09.